We had a meeting at a conference of venture capitalists (VCs, or vulture capitalists) at the SF airport Marriott (one of my favorites) on 11 September. I flew out the day before from Newark, and was going to meet our CEO there. I booked the cheapest fare on United, which involves the usual stop at Denver airport. It's a nice trip. But United lets you change flights on the day of travel without charge, if there is room. 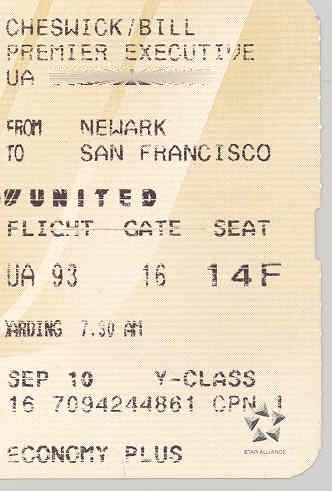 I had arrived early enough that flight 93 direct to SFO had not closed. The flight was nearly empty, and they popped me aboard. I remember thinking that the flight was so convenient, I could have taken it the next day, though that would be tight. I got to the hotel and settled in. My presentation was the next day. I didn't have a car: the Marriott is very close to the airport, but in a good way. The next morning I awoke and checked the computer for flight options home. I had booked for a lot of time and was unlikely to need it. I checked United, and all the flights were cancelled. "What's going on? This isn't a flight on Nepal Airlines!" The phone rang, Mom directed me to CNN, and the plans changed. After watching for a while, I went to the lobby and chatted with my boss. Nobody was giving a talk this afternoon, and nobody would be listening to a talk, either. I wondered about going home. I ran into Rick, who had rented one of the last cars from Hertz. He was looking for riders. I agreed. Some of the things I remember: the gorgeous scenery during the daytime bits. (Nevada was at night, so I saw pretty much none of that. Neither so much Indiana and Ohio, but who cares?) Memorable sites were wind turbines on a barren hilltop in eastern Wyoming, just after sunrise. Iowa hills in the late afternoon: those cornfields were amazing and under appreciated by those who fly over. Nebraska was pretty darn long and fairly boring. At one point, while driving, I taught both passengers how to program their cellphones (we all had Motorolas). There was plenty of time, we were bored, and there was no cell coverage in most of Nebraska. There is an arch over the highway in the middle of Nebraska. I remember that, and a truck stop offering back massages. Definitely a good idea, but we did not partake. We stopped once in Pennsylvania, and I checked the car's oil (it was a rental from Hertz.) It was down a quart, which is what you would expect after 2,500 miles, so I donated a quart of oil to the car. The route: when we left the San Francisco Marriott, we had a choice of going north and crossing the Bay on the Bay Bridge, or heading south to the next crossing south. We took the latter one, because we weren't sure if there was going to be more terrorism, and SF seemed like an obvious target, and easier than Silicon Valley itself. After crossing, we went up to I-80 and drove that the rest of the way, to Parsippany, where mom picked me up. I wondered if we were going to encounter state police at state boundaries. Sort of a security border patrol. There was a somber camaraderie at each stop with the other travelers. We were all going home, each in our own directions. Conversations with strangers were common. This was my most striking memory, and links with all the flags we saw on cars and attached to highway overpasses afterwards. Unlike the rest of the country, we weren't glued to TV sets, watching and re-watching things. We would turn on the radio for the latest sometimes. When Rick and I originally decided to travel east, we both wanted to stop at interesting places: see the world's largest frying pan, that sort of thing. We switched off driving and, by Nebraska, there was talk of spending a night in a motel to shower, sleep, and recover a bit. But in the US, you eventually get close enough to your destination (especially if it is home) to say "screw the motel, let's forge on the rest of the way." I've experienced this a number of times, say, after camping trips. In any case, the group dynamic was to push on. Even though there was no reasonable deadline for this trip (what employer would blame you for lingering a little?) the car had driven, accomplished, type A personalities, and we zipped on through. I could have stayed at the airport hotel in SF if I had wanted to. The company would pay, Marriott has cheaper distressed travelers' fares, the room was comfy, and the airport was right across a bit of water, spookily silent, and interesting to watch. I knew immediately that flights were not going to resume the next day, as they were saying, and predicted a Friday restart, which was exactly right. (I have met people who flew in the interim. One guy, a nuclear bomb expert, was flown from Sandia labs to DC.) I had a computer with me, and could get some work done in the quiet of the room. Such a time lapse of the airport might have been cool. But probably not allowed. The Marriott suddenly had security, people I called the LDS mafia, checking everyone trying to use the elevators. But on the phone, my daughter said "Come home daddy," I could, and so I did. I am glad I did: it was good to be home. And I had the opportunity to help get the Secret Service back on-line in their temporary quarters at John Jay after the destruction of their offices in 7 WTC.